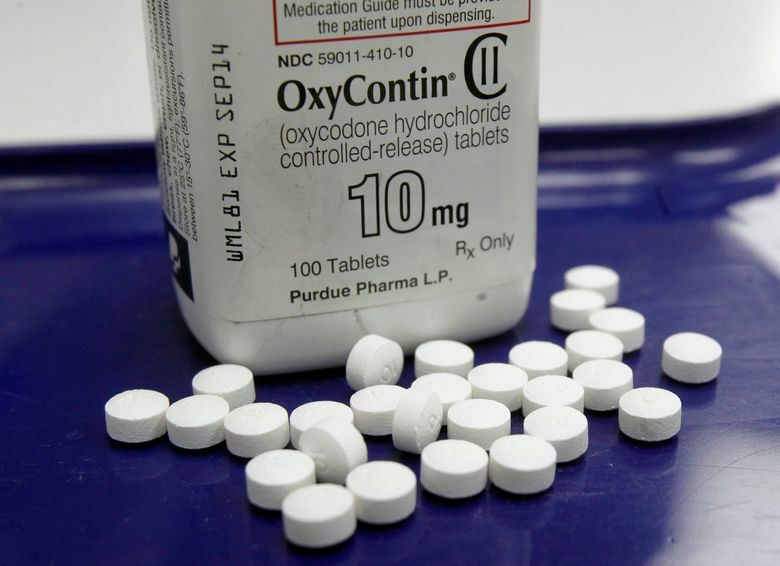 WASHINGTON (AP) — A federal panel that has recently criticized efforts to cut back on painkiller prescriptions is studded with members who have financial ties to drug companies. Nearly a third of members on the Interagency Pain Research Coordinating Committee have financial connections to makers of opioid drugs like OxyContin. The government advisory panel consists of federal scientists, outside academics and patient representatives. Of the 18 committee members at a recent meeting to discuss the government’s handling of pain issues, at least five had drug-industry connections. One, a pain specialist from Duke University, has received thousands of dollars in payments from drugmakers, including OxyContin-maker Purdue Pharma and Teva Pharmaceuticals, which sells generic painkillers. Another, a patient advocate, holds a nonprofit position created by a $1.5 million donation by Purdue. The revelation comes after the committee last month bashed a federal plan to recommend doctors scale back on prescribing painkillers for chronic pain. The guidelines by the Centers for Disease Control and Prevention are intended to curb deadly overdoses tied to powerful but highly-addictive opioid drugs, including Percocet and Vicodin. At the time, various committee members called the proposal “ridiculous,” ”horrible,” and “shortsighted.” A week later, the CDC said it would seek more public input on its guidelines — which were largely written behind closed doors. The apparent conflicts of interest on the panel underscore the pervasive reach of pharmaceutical-industry dollars, even among federal advisers who are supposed to be carefully vetted for such connections before serving. Financial payments from drugmakers have been shown to shape doctors’ medical decisions and researchers’ conclusions. Concerns about that influence led the federal government to begin posting drug-industry payments to doctors in 2014. Industry critics say the panelists should have disclosed their financial ties publicly at the meeting on Dec. 3, and in some cases, recused themselves from the discussion. Dr. Michael Carome of Public Citizen, a consumer watchdog group that is not connected to the panel, said the conflicts “reflect failings of the federal staff” who vetted the panelists. “It corrupted the process, or gives the perception of corrupting the process,” he said. The National Institutes of Health, where the panel convenes, said it cannot release the financial disclosure forms completed by the panelists, even under the Freedom of Information Act. “This is exactly the type of information that should be made available to the public,” said Dr. Andrew Kolodny, co-founder of Physicians for Responsible Opioid Prescribing, which advocates reducing painkiller use. The group is backed by Phoenix House, a network of rehabilitation clinics. One committee member who led the criticism of the CDC guidelines was Dr. Richard Payne of Duke University. At the Dec. 3 meeting, Payne questioned whether the experts who had helped draft the CDC guidelines may have been disproportionately biased against drug therapy. “Were there any conflicts of interest — beyond just financial — but conflicts of interests in terms of biases, intellectual conflicts that needed to be disclosed?” Payne asked. But Payne himself has financial links to multiple drug companies. Between 2013 and 2014 he received more than $8,660 in speaking fees, meals, travel accommodations and other payments from pain drugmakers, according to federal records. More than half of that amount came from Purdue Pharma, whose long-acting painkiller, OxyContin, had sales over $2.5 billion in 2014. Payne said in an interview with The Associated Press that as a professor, he does not regularly treat patients or prescribe medications. “I’ve disclosed the educational activities I’ve done and who paid for them,” he said. Payne also holds a chair at the Center for Practical Bioethics, a Kansas City nonprofit with longstanding ties to Purdue, Teva, Endo Pharmaceuticals and other drugmakers. In total, the Center for Practical Bioethics says drug and device companies have contributed about 4 to 5 percent of its funding in the last four years, though the center does not publish specific donation amounts. Christopher holds the center’s Kathleen M. Foley Chair for Pain and Palliative Care, named for a prominent pain physician. The chair was created through a $1.5 million initial gift from Purdue Pharma in 2009. At that time Christopher was CEO of the center. Christopher, whose term on the panel expired at the end of 2015, according to the government, said in an interview she received “very comprehensive” vetting to serve on the panel. It’s not clear financial ties like those between Christopher and Purdue would appear on government disclosure forms, which focus on individual’s finances and payments, not employers. At least three other panelists at the December meeting also work for nonprofits that receive pharmaceutical-company funding: The U.S. Pain Foundation, the American Chronic Pain Association and the Chronic Pain Research Alliance. Purdue Pharma gives money to all three groups. For now, the CDC continues to review its prescribing guidelines. On Thursday, the agency will hear recommendations from a group of outside advisers on how to proceed. As for the federal pain panel, at the conclusion of last month’s meeting, members agreed to send CDC a “formal critique,” of the guidelines. That document is still being written, according to panelists.